We are now heading into peak week for salmon on the Big Manistee River. Lots and lots of salmon everywhere on the Big Manistee River. Good numbers of larger, King Salmon this season with a decent amount of Coho as well. . Much larger average size this year. We are also starting to land a few steelhead each day. Also hitting a few Lake Trout below the coffer at Tippy Dam. Good numbers of King Salmon on the Big Manistee River. Michigan King Salmon Guides. Floats ans Skein on the Big Manistee River. Salmon fishing up North has been excellent! We are starting to see big numbers of both King Salmon, and Coho Salmon on the Big Manistee and Pere Marquette Rivers. Michigan Salmon Fishing is in full swing now! King and Coho Salmon are excellent table fare. We allow our clients to keep a limit of salmon per day. (5) Salmon per angler on the Manistee River. Big Manistee River: Tippy Dam is now starting to have good numbers of both King and Coho Salmon. Big numbers of Coho above the coffer at Tippy. A few of the salmon are beginning to hit gravel and spawn. Things are running behind schedule with the heat last week. Look for peak salmon season in mid to late October this year. Fishing is now just starting to get good! Some of the creek mouths have good numbers of Coho salmon. Manistee River has been hit or miss with big pushes of fish moving through at times. Water levels are great right now for good salmon movement. Crank bait fishing (Thunder sticks) has been consistently good during the mornings. Skein fishing behind log jams has been good during the day. Red and pink producing the most fish. Some Steelhead also beginning to come in near Insta Launch. Pere Marquette River Salmon: Most of the numbers of King Salmon have moved into the Upper Pere Marquette River- “Flies Only” Section. Incredible numbers of fish in the holes, with spawning salmon on gravel. Taylor Road, Upper to Walhalla, Barothy’s, and Rainbow Rapids to Sulac is loaded with salmon. Upper and Lower flies only water is also fishing very well. Stone flies, eggs patterns, leeches, and fry patterns are all producing fish. White / Chartreuse streamers in the morning. Muskegon River Salmon Fishing Report:(10/11) Cooler water temperatures and rain has helped bring in more salmon to the Muskegon River. Pods of fish are finally starting to move. A big push finally moved through Muskegon River and entered the river. There was a slight concentration above Thornapple in the “Pipe hole”, and a small pocket below the clay banks near Boat house. End of story, not much going on. Water temperature is still in the low 70’s. Too warm for salmon. Maybe a week or so and cold nights may bring up a few more Muskegon River salmon. I wouldn’t expect fishable numbers of salmon until mid October. Here are our open Michigan Salmon Fishing Dates for the Manistee River (Below Tippy Dam) or the Muskegon River (Near Newaygo). Guided Salmon Trips are all Inclusive, Includes all the gear, tackle, rods, reels that you may need. Heck, We’ll even clean your salmon for you! It’s should be an outstanding season with some really large fish this year. We are also expecting massive Coho Salmon migration later October, on the Big Manistee River – Fall Salmon Season. Salmon trips have been going well. Good numbers of salmon so far and they are huge this year!! If you get one, it will be big!! Scattered shots of salmon pushing in from the Lake. Both Pere Marquette Lake and Manistee Lake are starting to fill in. We are doing both jigging trips, and floats and skein for King Salmon in Michigan. Lake Michigan’s water temperature in Ludington last night was 47.6 degrees. Definitely a lake flip to bring in fresh salmon into the Pere Marquette River. This is our second big Push of Kings to happen before Labor Day. Trickle charge of salmon entering Pere Marquette Lake and River. Manistee Lake is also starting to load up. Michigan Salmon are large this year, I’ve heard of several 30 lb King Salmon landed off Manistee. It’s about to bust lose! Here are our available Michigan salmon fishing dates listed below. Thomas with a gorgeous salmon from the Pere Marquette River mouth in Ludington. Salmon are lots of fun! Good numbers starting to enter the rivers. Michigan Salmon Fishing. Last Chance for Muskegon River Smallmouth Bass in August! Smallmouth fishing has been excellent. Great trip before going back to school. Michigan Salmon Fishing Dates available for the Pere Marquette, Muskegon, and Big Manistee Rivers. ($395 / 2 anglers) All inclusive guided Michigan Salmon Fishing River Trips. 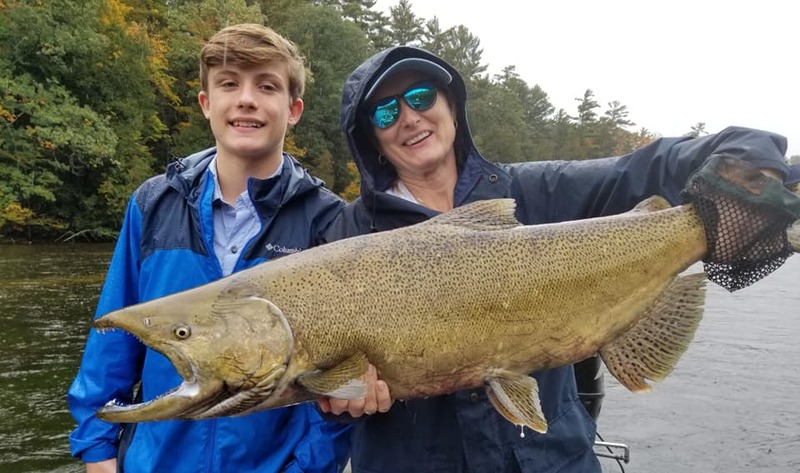 Michigan Salmon Fishing Guides – We’re very excited about the up coming 2018 Fall Salmon Season on the Pere Marquette and Big Manistee Rivers. We have a limited, 5 guide boats available for salmon fishing. Guided Salmon Trips are $395. Half days are $295. Per two anglers. It’s should be an outstanding season with some really large fish this year. We are also expecting a massive Coho Salmon migration on the Big Manistee River – Fall Salmon Season. Michigan Salmon Fishing Reports. Bobbers & Skein on the Lower Pere Marquette River. Rockin those big Kings! Skein Ballin’ the Lower Pere Marquette River. One of our most popular guided fishing trips is fishing King Salmon on the Lower Pere Marquette River. Drifting Skein (Fresh Salmon Eggs) From Indian Bridge to Scottville is a very productive method of salmon fishing. Bait Casters, Center pinning, or spin fishing works very well. King Salmon actually BITE salmon eggs under a float!! (Yes, I said bite salmon eggs) Salmon bite skein like a blue gill, followed by a hook set that sounds like a Muzzy broad head through a rib cage. No holds barred – Hand to hand combat with Michigan’s King Salmon. The Woodland Chinook of the Pere Marquette River.